dahlenaz wrote: Another highly supportive statement leads up to a related detail about rayed features. "There are differences in arc scarring effects depending upon the polarity of the discharge. An arc to an anode (positive) surface tends to stick to one spot and cause melting and uplift with relatively subdued features. An arc to a cathode (negative) surface tends to jump about, forming many circular craters with sharp features, rim craters and chains of craters. Electrons scavenged from the surface surrounding the main crater may form ‘rays,’ and sinuous rilles or channels. " Here too might be an opportunity to use the CRT experiments to demonstrate the larger electrical dynamics. The dual-monitor experiment may lend some clues, in that, material was removed from one screen leaving negative spiders and was deposited to the other as circular features with fingers around the rim. In looking at the spacing between the spiders, i've noticed that they, for the most part, do not overlap or encroach on each others space. Some do almost touch but the absence of intersection seems to point to the discharge of only the surface around them. Can it be? I read that article again and also ended up centering on the second quote you posted in relation to your CRT discharge experiment(s). You may be interested in a quicktime video at "ARCS AND SPARKS PHOTO GALLERY ARCS AND SPARKS PHOTO GALLERY". The series of 6 photos (fifth from the top) shows the position of the cathode and anode in the Hot Anode Vacuum Arc (HAVA). The film, linked below that photo montage, is rather large at 11mb (56k warning), but a worthwhile download to Wal's quote. And your experiments. 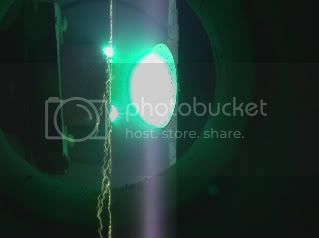 The anode (positive) is on the right side of the progressive snapshots and undergoes "melting and uplift" as it forms a "plasma plume". On the left side of the snapshots is the cathode (negative). When you watch the movie you'll see not only the cathode arcs 'jumping about' the copper cathode but you will also see the "streamers" (lightning) that I think produce the "‘rays,’ and sinuous rilles or channels." - despite the relative small size of the cathode surface. 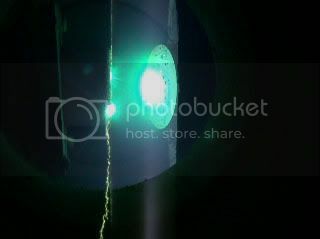 When the cathode's 'jumping arcs' occur 'below the plane of it's surface (on the sides of the cathode in the video) I guess that would correlate with planetary 'subsurface lightning". From the results you've posted when you pass your CRT's in close proximity in comparison to the Hot Anode Vacuum Arc process it appears that, yes, 'it can be' that you've rather successfully demonstrated planetary EDM, arc scarring, electrostatic coronal discharge, and 'down the barrel' patterns that reveal the multiple phases of the electro-plasma dynamic. The only difference between your CRT's and the same results on planets is a matter of distance. A rather small concern for a 'relativistic particle beam'.